I had never been to Sri Lanka before. From being that naughty monkey dressed as Hanuman, trying to destroy the stage in kindergarten during a play, to being an inquisitive traveller asking his friends for suggestions on which places to go eat at Colombo and Unawatuna; my journey to know all about the land of Ravana had gotten me as excited as I expected myself to be, when I disembarked the Genting Dream Cruise at Colombo, last year. “Endless beaches, timeless ruins, welcoming people, oodles of elephants, rolling surf, cheap prices, fun trains, famous tea and flavourful food make Sri Lanka irresistible” – Lonely Planet. I apologise for the terrible delay in sharing this travelogue with all of you. I will still hope that my experiences and sincere recommendations help you during your time in Sri Lanka, especially if it’s your first time like it was for me. We reached Colombo in the afternoon but managed to disembark the ship and exit to the city only around 7:30 PM, so we decided to check-in at Fairview Hotel first and take a stroll down Marine Drive and enjoy dinner at our first culinary pit stop of this trip at Barracuda – which luckily wasn’t more than a kilometer away and unexpected November Rain at that time, made our walk unforgettably romantic. After walking for 15 to 20 minutes, we reached Barracuda much hungrier than we were before leaving the hotel. After browsing through eeveral reviews on Zomato and TripAdvisor, I was sure their sea food would be enjoyable but on the contrary; Snehsha, who’s a vegetarian, was sure she might not find anything praiseworthy for herself. I was right and luckily she was wrong too. The vegetarian food was delicious too! Sea Food Tom Yum Soup at Barracuda, Colombo, Sri Lanka. HongKong Chicken Vermicelli Noodles, Barracuda, Colombo, Sri Lanka. Veg Bean Curd Sizzler, Barracuda, Colombo, Sri Lanka. My mix sea-food soup included fish, squid and huge jumbo prawns. It was fresh, impressively zingy and the portion-size was much larger than I expected. She ordered for a small portion of their bean curd sizzler which was topped with some hot and addictively delicious garlic pepper & shiitake mushroom sauce. The HongKong style chicken vermicelli noodles were disappointingly bland but the intense flavours from the other two dishes, were enough to make up for its lacking in every way. Dining at Barracuda was undoubtedly a good start to our trip in Sri Lanka and I’ll be happy to go back for lunch or dinner soon again. A decently fair view from Fairview Hotel, Colombo, Sri Lanka. Our second day in Colombo began with various explosive Sri Lankan flavours for her and a few continental favourites for me, served during breakfast hours at Fairview Hotel. She enjoyed her idiyappam (string hoppers), thick dal curry, green chili chutney, coconut sambhal, some garma-garam upma, sautéed onion chutney, a big bowl of comforting Kiri Hodi (Sri Lankan gravy made with coconut, milk & lime) and Kimbula Banis. The result of a local attempt to imitate internationally acclaimed croissants, made in the absence of refrigeration and solidified butter, where the resulting bread uniquely stood on its own to become a popular breakfast or snack item in Lanka: Kimbula Banis. Sri Lankan Breakfast at Fairview Hotel, Colombo, Sri Lanka. I enjoyed having some toasted multigrain bread and crispy butter croissants with chicken-bacon strips, smoked chicken sausages, cheesy scrambled eggs, a glass of fresh orange juice and some muesli with cold milk on the side. We were not completely happy with the view but our breakfast was honestly very unexpectedly satisfying. Before I left from Mumbai, I was told by many friends that Sri Lanka is paradise for beach lovers. For those who know me well, will certainly know how much I enjoy swimming in any ocean. After a local but heavy breakfast experience, I could not resist my urge to check out Mount Lavinia Beach nearby; for a quick swim and a short snack break afterwards. Mount Lavinia Beach, Colombo, Sri Lanka. Trying Lanka’s Lion lager, perfectly chilled for a hot day on the beach! A happy but antisocial me, enjoying the peace after a swim at Mount Lavina beach. Sri Lanka is known for its wonderfully welcoming and selflessly helpful people. We met one such representative too; Bhanu, our young and dashing rickshawallah, who not only took us to Lavinia beach but waited there for a few hours to take us back to the hotel. He even came to our rescue with an umbrella, looking for us aimlessly on the beach; solely with the intention of taking us back to our hotel safely before lunchtime. I believe local people can always make tourists feel at home and bring them back for another memorable conversation with a stranger soon. Bhanu, thank you for being such a sweet stud! After a quick lunch in our room, we decided to enjoy a long nap before it was time for our early-dinner reservation at The Gallery Cafe. Establishededin 1998, The Gallery Café is housed in the former offices of world-renowned Sri Lankan architect: the late Geoffrey Bawa. The restaurant is internationally acclaimed and has become a must-visit for anyone visiting the city of Colombo, especially fine-diners looking to enjoy international cuisine and perhaps also a dessert menu that includes over 30 irresistible choices with a single focus on chocolate. Entrance of The Gallery Cafe, Colombo, Sri Lanka. Out of everything we ordered at this wonderfully artistic and classy cafe, I enjoyed the Mediterranean Chicken Salad the most. The sharp and smooth taste of their honey-mustard-vinegar dressing tossed with chickpeas, juicy tomatoes, cucumber, fresh basil leaves, crunchy and smoky toasted cashews plus something that I don’t enjoy usually but definitely did this time: raisins. The colours on our plates added value to the art around us and the variety of textures and flavours in this salad, made it a treat for our palates as well. Mediterranean Chicken Salad, The Gallery Cafe, Colombo, Sri Lanka. Paradise Road Galleries features monthly rotating exhibitions by established and emerging local artists; glimpses from the ambiance and moments spent here in candle-light, will definitely stay in your mind and heart forever, and probably your partner’s too. S/he’ll appreciate a dinner here, take my advice, take him/her here. Our reserved table at The Gallery Cafe. We decided to swig a nightcap or two at a local bar nearby before calling it a day. We wanted to rest up well for our short road-trip to Unawatuna on the following day. I was obviously very excited for another breakfast buffet experience at Fairview and here’s what our table looked like in the morning. Idlis, Sri Lankan curries, scrambled eggs, croissants & more. Fairview Hotel serves delicious Sri Lankan curries for breakfast & lunch every day. We checked-out after breakfast and hopped into a cab booked by the hotel for us, which had arrived on time to pick us up for a 2-hour-long journey from Colombo to Unawatuna: a coastal town in Galle district of Sri Lanka, famous for its beautiful beaches, ancient artefacts, magnificent sea-front views and deep coral reefs. “A seashore dotted with thousands of trees, coconuts, and palms dominating, strings of houses and hermitages along the coastline, human beings and superior beings such as Gandharvas, Siddhas, and ascetics, living in them and countless bejewelled celestial nymphs thronging the shore, the coast intermittently visited by heavenly beings, Gods and demons.” The description of the beach paradises in Valmiki’s epic Ramayana sounds like what we saw and experienced at Unawatuna: a paradise on earth indeed. Unawatuna (cute name na?) is approximately 120 kilometres south of Colombo and it took us around 2 hours to reach our next hotel: Cantaloupe Levels. The resort’s location was superb, with the historic city of Galle just 6 kilometres away and a walkable distance away from Jungle Beach. I walked in pleasantly surprised when I discovered my suite has a living area and a massive bathroom inside! Beautiful infinity pool on the ground level of Cantaloupe Levels at Unawatuna. Our bed was huge and comfortable, overall cleanliness of our suite was great and it had everything beyond our needs. It even had a private jacuzzi for 2 in our bathroom! The bathroom was probably bigger than our room but hey, I’m not complaining! After freshening up quickly, we were ready for a rather late lunch at the property and the executive chef was kind enough to willingly serve us and also help us with recommendations from his kitchen. As it started to pour heavily again, we decided to stay indoors that day and enjoyed our lunch, on innovative and comfy beds next to the infinity pool; jumping in for a dip or two between our first and third courses. Cantaloupe Levels, Unawatuna, Sri Lanka. King-size beds next to the pool, where food is stylishly served on bed table trays. Wholesome bread basket to begin with, before we placed our orders. Having lunch in bed is probably the new breakfast in bed? She ordered a Four Cheese Risotto and I requested for a portion of chef’s recommended Buttermilk Fried Chicken, which was served on a bed of garlic mash and topped with sautéed greens + wine pepper sauce. The chicken was perfectly cooked and the flavours impressed us as much as its presentation did. The risotto was enjoyably cheesy, creamy and perfectly al dente. 4 Cheese Risotto at Cantaloupe Levels, Unawatuna, Sri Lanka. Buttermilk Fried Chicken at Cantaloupe Levels, Unawatuna, Sri Lanka. A deserving dip and nap after that lunch, under the cloudy sky. Just before sunset, at 5 PM, we decided to go check out the famously serene and infamously deserted Jungle Beach nearby, less than half a kilometre away from our hotel. It takes some effort to reach this private beach, took us a mini trek to get there, but it is an unforgettable into-the-wild experience down there. Trekking at Jungle Beach, Unawatuna, Sri Lanka. Jungle beach is like a hidden pearl, waiting to be discovered by all tourists visiting Sri Lanka, especially those who have Unawatuna in their itineraries. Its breathtaking pathway with beautiful streams and ponds along the way, provided a touch of wilderness and serenity I was looking for on that day. Jungle Beach is a highly recommendable experience for all of you who like a little adventure and/or those love exploring secluded beaches while traveling. Cantaloupe Levels in Unawatuna is an ideal place to stay and/or dine for couples visiting Sri Lanka. Dining at Cantaloupe Levels was nothing short of a magical experience. The hotel’s air-conditioned restaurant is on the ground floor and serves up some of the best Asian-fusion cuisine in Unawatuna or Galle area. To the front of the restaurant, sliding doors open onto a series of velveteen lawns topped with tables for dining alfresco under a balmy starlit sky, a 270-degree view and a large selection of wines from many of the world’s most respected regions is featured in their cellar. On the following day, we were going to meet Nishit & Phorum Dalal at Kat’s Coffee for breakfast. Phorum had got me all excited by telling me the cafe was owned and managed by a young lady, who serves only cakes and coffees all day long. Kat’s Coffee, Unawatuna, Sri Lanka. Kat’s Coffee is a comfy cafe with delicious cakes and motivational coasters! The wi-fi password of this cafe is “cakeforpresident” and if not for those yummy apple pies and frothy cappuccinos, I’d love to go back just to meet Kat and enjoy free wi-fi in a place like Unawatuna; a remote location with minimal network coverage almost everywhere. After breakfast, four of us decided to visit Galle Fort, a location in the Bay of Galle on the southwest coast, which was built first in 1588 by the Portuguese and then extensively fortified by the Dutch during the 17th century. It is a historical, archaeological and architectural heritage monument in Sri Lanka, which even after more than 425 years maintains a polished appearance; all thanks to the extensive reconstruction work done by the Archaeological Department of their country. One cannot go to Galle and not click pictures! 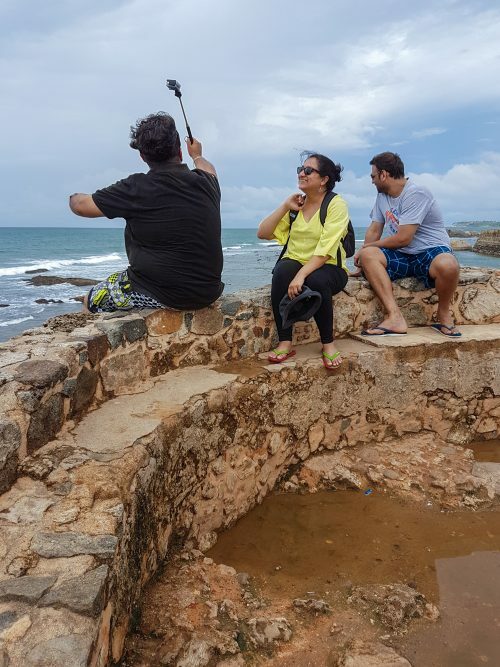 Enjoying a memorable moment with Phorum & Nishit Dalal at Galle Fort. Galle truly resembles a small walled town with a rectangular grid pattern of streets surrounding it; low houses with gables and verandas built in the Dutch colonial style. It did not seem like we were still in the Indian subcontinent, not at all. 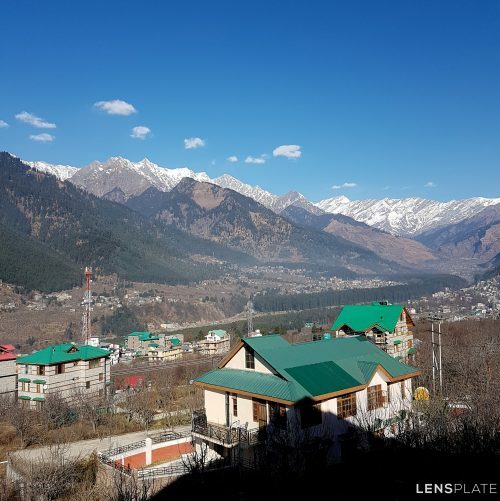 The fort area also has a number of historic churches, mosques, government buildings and several restaurants, bars and coffee shops for tourists like us. Shopping for artefacts at Galle, Sri Lanka. In middle of a conversation with my new friend at Galle. There are several museums and antique shops at Galle that display curiosities on the island’s most colonial era. A wide variety of jewellery, woodwork, lace-work, textiles, antics and quirky knick-knacks are available out there. The narrow streets are dotted with Dutch villas and there’s a welcome absence of vehicular traffic almost everywhere you’ll go. If you’re looking for specific recommendations on which shops to visit, I suggest you read this article on Condé Nast Traveller’s website. If you like coconuts, don’t forget to try some fresh and sweet coconut water on the streets of Galle. After spending adequate time at Galle, I wanted to leave for Colombo and have lunch at the most popular restaurant in Sri Lanka: Ministry Of Crab. Unfortunately, unpredicted gloomy weather delayed the arrival of our cab and my dream of eating the biggest and freshest crabs in the world at MoC, was crushed completely by uninvited heavy rainfall. On asking the hotel’s management for a Sri Lankan lunch recommendation nearby, their suggestion was to visit CoCoBay Resort for a lunch and a sea-front view to remember forever. Snehsha ordered for a portion of spaghetti and I decided to go for a fixed Sri Lankan meal: an order that came with 10 dishes on a tray! The meal was served with Sri Lankan beef curry and 8 different kinds of vegetable curries: bandakka (okra) curry, kesel (banana) curry, gova (gobi) masala, ratha (beetroot) masala, thumba (spinygourd) curry, potato thompad, mango curry and potato masala along with some lemon pickle, chilli paste, mango chutney and repeated requests for papadams! A massive Sri Lankan feast to remember forever! A magnificent landscape view with this affordable (LKR 1300) and satisfying meal, definitely deserves another visit to CoCoBay Resort. Please don’t forget to go here during your first or next vacation in Sri Lanka. It will be safe to conclude with stating Sri Lanka is a paradise that has been hiding in plain sight, far away from countless of travellers who have flown over this country on their way to someplace else. Plans of uncertainty has kept the land of Lanka off many itineraries, including mine, but after my personal experience, I can vouch for its history, culture, good food and natural beauty. Sri Lanka is spectacular. It’s affordable and it’s even often uncrowded. Now could be the best time to discover it.